Black Friday weekend sale! 20-50% off! Ho ho ho, it's that time of year again, and we are not immune from the kickoff of the holiday shopping season! Take a look at our newly updated sale section for some crazy deals on many, many items - including many you've never seen on sale before (and likely never will again)! We'll be ending this sale on Tuesday morning - while it's possible some items may stay on clearance, why take that chance? Quantities are limited and many of these items will return to regular price, so there's no better time than now to hit that checkout button. requests now and we will hold your place in line for our stock. Based on past experience, we expect these series to be very difficult to get. had many requests. Reservations are not guaranteed until confirmed by BTSSB. 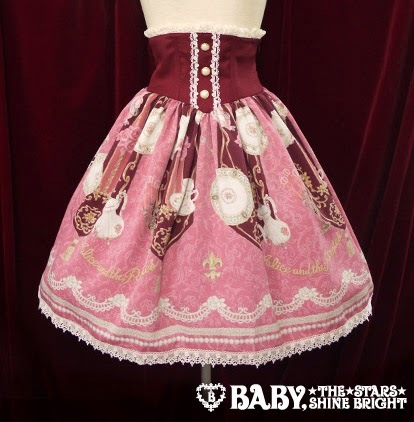 New items from Baby, the Stars Shine Bright in stock! It's getting to be that time of year... time to buy a little something for yourself before the holidays! Check them all out on our New Arrivals page! happens sometime after the official reserve date. We have four new Victorian maiden items to post today, including Victorian lady items for 2013! This is a quick one! We don't write a lot of live reports, but Aldious stands at the crossroads of music and fashion, and sometimes we like to just bring you guys something fun. It's a rare day that we happen to be in Japan at the same time a certain KERA model we know is playing live with her new band, so we couldn't pass up the chance to go to the show. We were given full access to bring you some great photos and video! Read on to the end for a special introduction from the band themselves! There's a boom in all-female bands in Japan right now, and Aldious is the most powerful and popular of Japan's female metal bands. Their three studio albums have all hit the top 10 of the Oricon daily charts. Re:NO joined the group a little more than a year ago, and she's already written and performed some of their most well known songs. The band's first album with Re:NO, District Zero, also reached their highest chart position so far - #7 on the Oricon Weekly Album Ranking chart (and #4 on the daily chart). The set list was about evenly mixed between new and old - Aldious have even re-released a few of their older songs with Re:NO singing. Re:NO's brought a new look and sound to the band, but they're not afraid to play the songs that won them their longtime fans. One of the great things about Japan is that even top-charting bands still play "live houses" - small club venues. Thumb Up is a live house, which makes it easy to get close to the band, and makes for a pretty crazy crowd! Of course, the band announced that the venue was sold out. They told us the crowds are getting bigger on every tour! Yoshi's one of the band's founders and its main songwriter. All the musicians in the band are virtuosos, though - the instrumental songs they played were as fun to watch as Re:NO's vocals. But Re:NO really knows how to rile up a crowd. Aldious isn't her first band - like a few of the other KERA models, she's actually been in music for years, and she owns the stage. Their music videos look serious, but on stage the entire band is actually smiling almost all the time. They really seemed to be having fun playing this show. Of course, no Japanese concert is complete without MC segments, and Aldious spent theirs talking about the tour, Yoshi's new skirt, and filming their last two music videos. Since the latest single is a double A-side, they filmed both videos at the same time and it took more than 24 straight hours before they could go home. Re:NO did a full wardrobe change for the encore, into the white dress that she's wearing in the I Don't Like Me music video. Re:NO wrote this song herself. The crowd went insane at the end of White Crow, the last song in the show. Check out the band's official homepage. The flowers we sent to the band! This is a custom in Japan, and you'll see it for most bigger bands. Re:NO also wrote about these flowers on her own blog. Just a quick note to let you know we're back on US soil and have resumed regular services. Bear with us for a couple of days as it may take us a little time to get fully caught up on email responses, sending invoices, posting new reserve series and other things we normally do, but we are already caught up on shipping orders out. It was a successful trip (as usual!) but the one thing from it you'll see very shortly is our Aldious live report. We don't do a lot of live reports, but then it's not often that KERA models we know begin singing for famous bands and happen to be playing while we're there. And we like to give you guys something new to look at after every trip we take to Japan. Re:NO was awesome, as was the whole band, so watch for that report in the next couple days! The rest of our trip was behind the scenes meetings, but you'll get hidden benefits from that too... and who knows, maybe something bigger a little later.